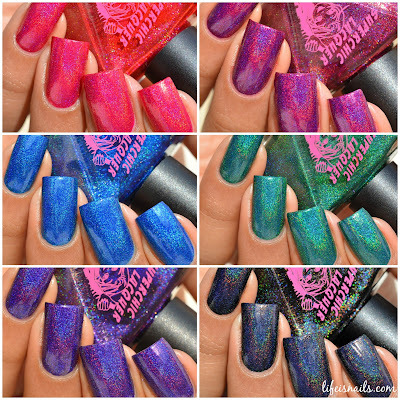 Today I have swatches of Superchic Lacquer amazing Dreamology collection to share with you!! Dreamology collection consists of six intense linear holographic power shades. all the shades are fully opaque in just 1 coat! Because of such high pigmentation in these shades, Jen from Superchic Lacquer clearly mentions about the possibility of staining especially on porous nails. So it's recommended to use a high-quality base coat for these. For my swatches, I used Superchic Lacquer 'Bring it on' Stain blocker and Color bonder Base coat. and for the top coat, I will be using the new and amazing Superchic Lacquer ' Marvel Star' - Neon Luminescent Liquid Macro Top Coat which glows under blacklight UV lighting! Realm Of Erotica - A gorgeous racy red polish with intense linear holographic effects. Shown here is one coat plus Top coat. Wake me up - A spectacular Red- berry polish with intense linear holographic effects. Shown here is one coat plus Top coat. R.E.M - A jet black polish with intense linear holographic effects. Shown here is one coat plus Top coat. I don't know why this polish looks a little navy bluish in the pictures, but it's more like jet black in real. No Rest For The Wicked - A beautiful and deep emerald green polish with intense linear holographic effects. Shown here is one coat plus Top coat. 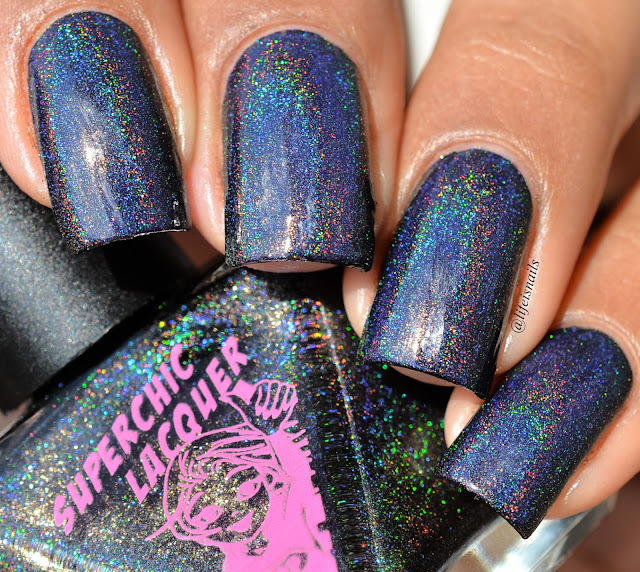 Lucid LaLa Land - A stunning and deep lucid blue polish with intense linear holographic effects. Shown here is one coat plus Top coat. 40 Winks - A beautiful and deep violet purple polish with intense linear holographic effects. Shown here is one coat plus Top coat. Overall I loved this entire collection! I did not want to remove any of these stunning shades from my nails:D. I was in awe every time I applied the first stroke of each of these polishes, such nice pigmentation, Brush is wide as well giving perfect 3 stroke finish. 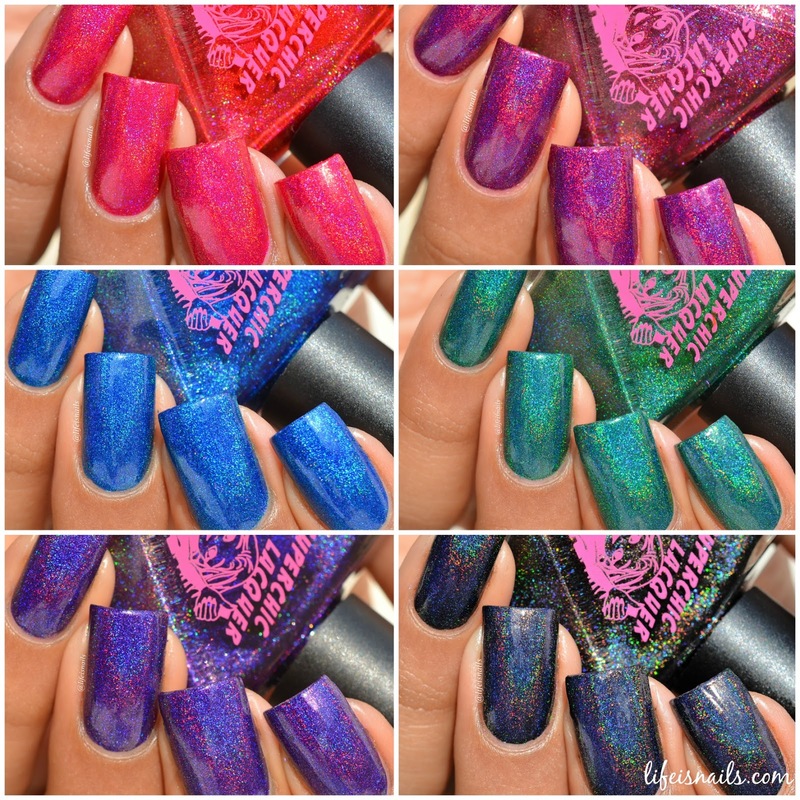 It's so hard to choose a favorite among all of these stunning shades, but if I have to select any one or two, that would definitely be Wake me up and Realm of erotica.